This summer, I’ve been hitting on some favorites with a twist! And I think it’s time for one more. Key Lime Pie is a serious weakness of mine. If I see it on a menu, it’s hard to say no. Seriously… I have no will power when it comes to Key Lime Pie. 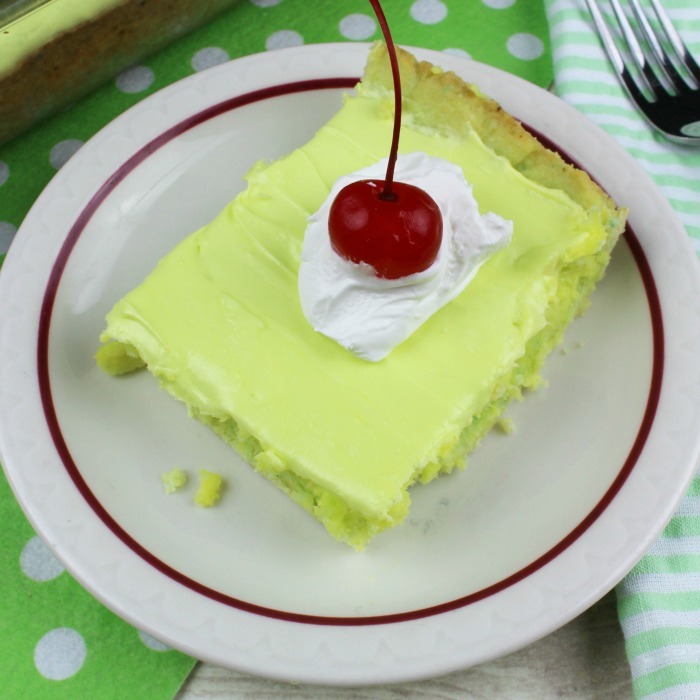 If you love the combo of sweet and tart like I do, you’re going to crave these easy key lime pie bars! 2. Spray a 9 X 13 pan with non stick coating spray. Set aside. 2. In a medium mixing bowl, add the cake mix, stick of butter and one egg. (Make sure the butter is softened or the mix will be lumpy). Mix until well incorporated. 3. 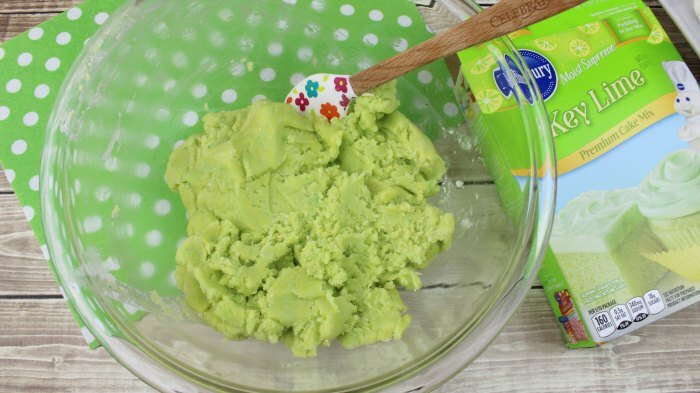 Press the cake batter mixture into the 9 X 13 pan. This will be the crust for the pie bars. 4. In a medium mixing bowl, add the powdered sugar and 3 Tablespoons of butter. With an electric mixer on medium speed, add the lime juice and beat for one minute. 5. Add the cream cheese and food coloring and beat on medium speed for an additional minute. 6. Scoop out 1 cup of the icing to a small bowl and set aside. 7. Add 2 eggs to the remaining icing and beat on medium speed until light and fluffy. 8. Pour on top of the crust and bake for 28-30 minutes. 9. Allow bars to cool for 30 minutes before spreading the reserved cup of icing on top. 10. 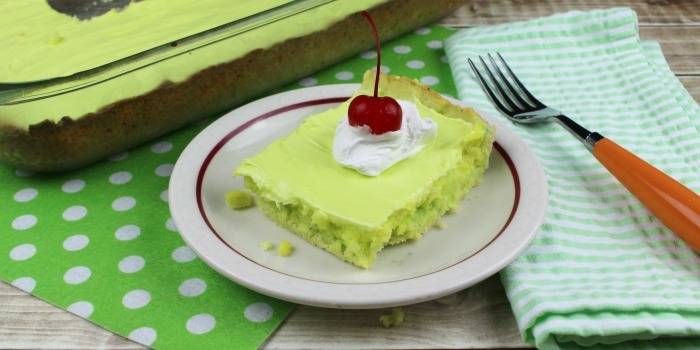 Cut into squares and serve with whipped cream and a cherry (optional). For more scruptious desserts on Mommy Evolution! Spray a 9 X 13 pan with non stick coating spray. Set aside. In a medium mixing bowl, add the cake mix, stick of butter and one egg. (Make sure the butter is softened or the mix will be lumpy). Mix until well incorporated. Press the cake batter mixture into the 9 X 13 pan. This will be the crust for the pie bars. In a medium mixing bowl, add the powdered sugar and 3 Tablespoons of butter. With an electric mixer on medium speed, add the lime juice and beat for one minute. 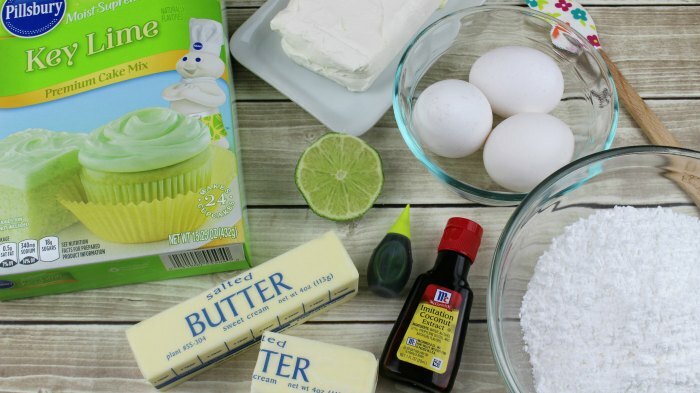 Add the cream cheese and food coloring and beat on medium speed for an additional minute. Scoop out 1 cup of the icing to a small bowl and set aside. Add 2 eggs to the remaining icing and beat on medium speed until light and fluffy. Pour on top of the crust and bake for 28-30 minutes. Allow bars to cool for 30 minutes before spreading the reserved cup of icing on top. 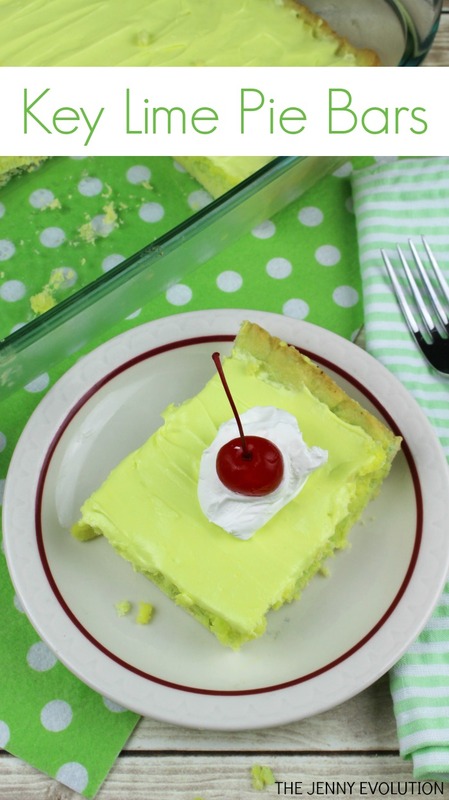 Cut into squares and serve with whipped cream and a cherry (optional). I love key limes – the perfect little citrus treat!! Thanks for sharing on the What’s for Dinner link up and don’t forget to leave a comment at the party – Next week’s features that also leave a comment get pinned and tweeted! Oh my, this looks so good. These bars look SO tasty! Thanks so much for sharing your yummy recipe on the Monday Funday Party! I was wondering about those! Thanks- I’ll have to try! HI! These looks amazing! Thank you for linking up to last week’s Tasty Tuesday linky. I have pinned your recipe to the Tasty Tuesday Pinterest board. I hope you’ll join us again this week. Key lime pie anything is a favorite of mine. I’m always excited when I find something that is a variation from what I have already had. I can’t wait to try these bars. Thank you for sharing on Happiness is Homemade link party. Shared and pinned. I love key lime! Thanks for sharing on the what’s for dinner link up. Looks yummy! Thank you for sharing on Merry Monday! Hope to see ya next week! Now these bars look too good to eat! Thanks so much for sharing with us at #overthemoon link party. I’ve shared on social media. Have a great week and see you next week. 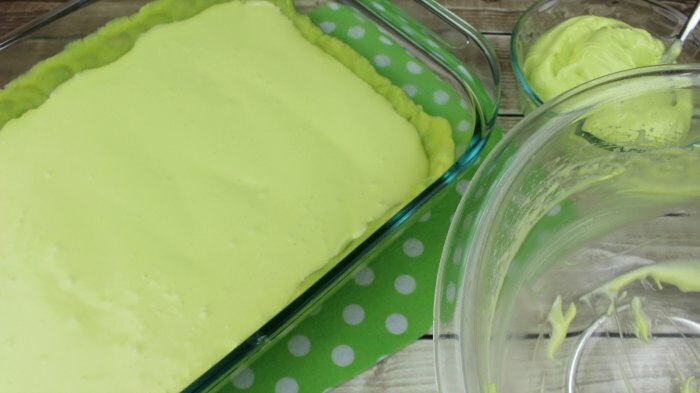 I just pinned your amazing Key Lime Pie Bars, can’t wait to try these! Hope you have a great 4th of July weekend and thanks so much for sharing with us at Full Plate Thursday!